This is how to start a training block for an athlete or a group of athletes. This means the block of training will be applied to them and it will appear on their calendar and schedule. 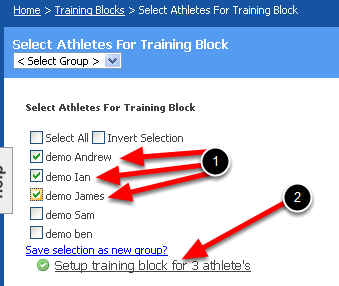 To apply a Training Block to an Athlete or a Group of Athletes, click on "Start Training Block". Place a tick beside the athlete/s you want to apply the Training Block to. For this example, three athlete have been selected. We could have selected a personal group using the "Select Group" button shown here (set up in the Personal Groups Page). Click "Setup training block for 3 athlete's". Choose the start date and time that you want to schedule the sessions for the Athletes. 1: Choose the Date that you want the Training Block to be applied to the Athlete/s. The training block starts from the date you select. For this example, the user selected to start on Monday 2nd November (Monday) as the start of the Block. 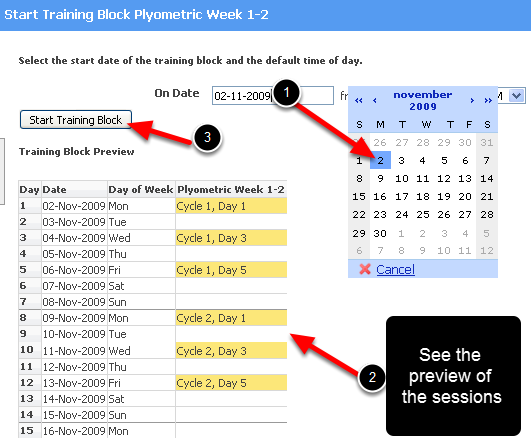 If you select a different start date, you will see that the date on the Training Block Preview will change and different days will be highlighted. -Select the time that you want the event to be scheduled in the athletes' Calendar and My Schedule Page. For example, if you want them to each do a plyometric session at 9:00am to 10:00am, then you need to choose a start time of 9:00am and a finish time of 10:00am. 2: Check that the sessions are occurring at the correct day on the Training Block Preview. If they are not choose a different start date. 3: Click "Start Training Block". If no prerequisites are required e.g. the plan is NOT pulling in other data such as a 1RM or Max HR or Max cadence that need to be entered in order to generate the correct %1RM or %HR then the plan will be applied. Users are then taken to the "Printing" page where they can create pdf's of the individual athletes plan (which can be printed off or e-mailed), or the entire squad of athlete's plan. If the plan is linked to pre-requisite data, this will need to be entered. See the subsequent steps below. Once a user applies a plan, the system will automatically take them to the Print Page. Please see the next lesson on Printing Plans to see how to Print off a Plan for your athletes. Some sessions may have other data that needs to be entered to be able to complete the session plan. For example, if a strength session is linked to 1RM max form, the athlete's 1RM's need to be updated before they start the plan. This is called a "prerequisite" because you need to enter the 1RM's before the %1RM will show in the strength training form. Users can Click on "Start without prerequisites" if they have previously entered in the prerequisite data for the correct exercises. This means any historical entries for 1RM will be used in the %1RM calculations for the strength sessions used in the training block. A Table will appear for that will include any exercises from the Training Block. 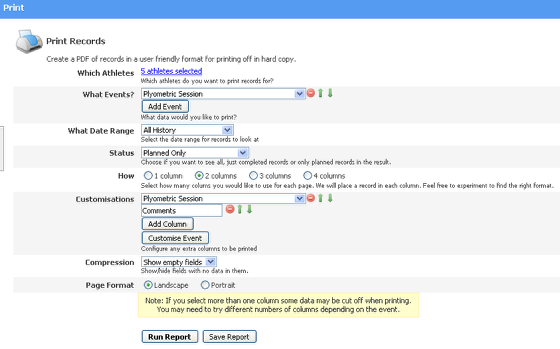 You can complete the Prerequisite data for each athlete and then click on Save and Close. All of the prerequisite exercise/drills will be displayed for the user to enter in the athlete's 1RM data. If the user choose to enter for a group of athletes the correct exercises would be displayed for the entire group. Update the prerequisites and click "Save and Close". A pop up box will then ask if you want the sessions to be updated automatically into reflect the new pre-requisite data Click OK. This means the prerequisite data you have just entered will be used to calculate 1RM for the each athletes that you entered the pre-requisite data for. 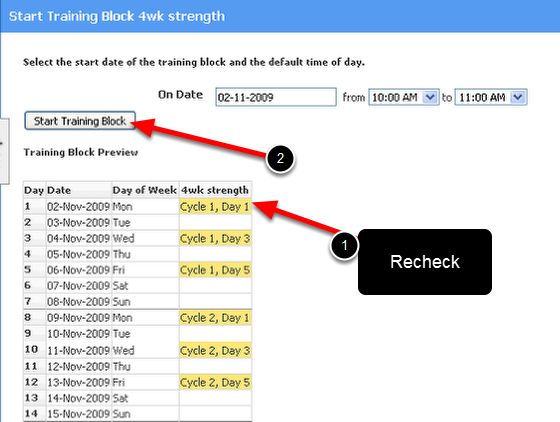 Recheck the Start date and time in the Training Block Preview and click "Start Training Block"
Now press the "Start Training Block" button again after you have checked the dates and times.